To Cite: Faramarzi H, Khalily Zade M, Bazrgar M, Panahi N, Fathi B. Statistical Study of Clinical Predictors of Influenza A (H1N1) in Iran, Arch Clin Infect Dis. 2012 ; 7(3):88-91. doi: 10.5812/archcid.14385. Background: Influenza A (H1N1) has common signs and symptoms with other respiratory tract infections, but due to heavy socioeconomic burden of influenza A (H1N1), consideration of some symptoms to start the treatment on the proper time is an especial important point. On the other hand, these symptoms and signs may be depended on regional weather conditions or genetic traits of Iranian people. Objectives: The purpose of this study was to evaluate the findings of this re-emerging infectious disease in Iran. Timely diagnosis with regard to the factor whether the findings vary within regions- is helpful with early treatment, better patient's outcome and more effective prevention. Patients and Methods: We have analyzed clinical symptoms and risk factors and duration of hospitalization of patients who had been referred to Ali-Asghar hospital in Fars province between October 26, 2009 and February 16, 2010. Results: RT PCR test has been conducted on 371 probable patients and found 46 confirmed cases of influenza A (H1N1). The most common symptoms in these cases were cough, dyspnea, chill, myalgia and fever. There was not any significant correlation between these symptoms or symptoms with low prevalence or suggested symptoms by WHO or CDC or ILI with negative and positive PCR results. Conclusions: Among confirmed patients with influenza A (H1N1), the most common symptoms were sequentially cough, dyspnea, chill and myalgia. PCR did not show high sensitivity in diagnosis of influenza A (H1N1) infection. The risk factor with the highest prevalence was heart disease followedby cigarette smoking and hematologic disorder. The mean age of these patients was about 38. Influenza A (H1N1) spread widely in 2009 and emerged as a world health problem. Rapid diagnosis and treatment of severe infections can save many lives, therefore relying on clinical signs and symptoms are very important in epidemic incidents. The prevalence of signs and symptoms may be different in different areas because of different climates and genetic characteristics (1). On the other hand, a test with high sensitivity and specificity can help to confirm the relationship between signs, and symptoms and Influenza A (H1N1) incidence. We tried to find the best predicting symptoms and determine their correlation with RT-PCR test that is accounted as the gold standard in diagnosis of Influenza A (H1N1)(2). Timely diagnosis and whether the findings are different from one region to another are helpful with early treatment, better patient's outcome and more effective primary prevention. This study was carried out in Ali-Asghar Hospital in Shiraz. This center had considered as a referral center for moderate and severe patients with probable Influenza A (H1N1) infection that had been supposed to cover the whole population of Fars province. 487 patients admitted in this center from October 26, 2009 to February 16, 2010.The epidemic had a soaring trend; therefore 116 patients who were referred to our center at epidemic onset were excluded due to the preparation of test materials and study design. We sent the nasal (56) or oropharynx samples (330) of 371 patients hospitalized or managed in the outpatient clinic with regard to advises of manufacturing company of RT-PCR test. The result was positive in 46(12.4%) patients. Questionnaire which has been filled in for each patient by trained physicians, including demographic data, signs and symptoms, laboratory data, contact with patients who had a history of Influenza (H1N1), risk factors, contacts, diagnostic and therapeutic managements. People with contact history without any respiratory symptoms were excluded from this study, thus PCR test was not performed. We analyzed several clinical diagnostic criteria of Influenza A (H1N1) infection. The center for Disease Control and Prevention (CDC) in US, defined the clinical diagnostic criteria as the presence of fever (more than 37.8°C) or recently medication with antipyretics and one or more of the following symptoms: rhinorrhea, nasal congestion, sore throat or cough(3). The World Health Organization (WHO) defined the clinical diagnostic criteria as the sudden onset of fever (38°C) and cough or sore throat (4). Influenza likeillness (ILI) criteria is defined by the presence of fever and two of four following symptoms: cough, sore throat, myalgia and headache (5). Specimens were collected using nasal or oropharyngial swabs by trained nurses; and were kept in the cold chain refrigerator and sent to the laboratory. Influenza A (H1N1) positive case was defined as positive result of Real Time PCR using invitrogen ® one step qRT (Carlsbad, CA9 2008 USA). On the contrary, a negative result on RT-PCR was defined as negative Influenza A (H1N1) infection at first. Continuous variables were expressed as mean ± standard deviation or medians (with interquartile ranges), categorical variables were expressed as percentages. Demographic and clinical characteristics were compared between patients with PCR positive test and PCR negative test using the independent T-test for continuous variables and goodness of fit test for categorical variables. Then the prevalence of each symptom was calculated. All analysis was conducted by using SPSS 19. All statistical tests were two-sided and their predefined significance values were considered as P < 0.05. Among 371 patients who were included in this study, 46 patients (12.4 %) with positive PCR were known as confirmed patients. 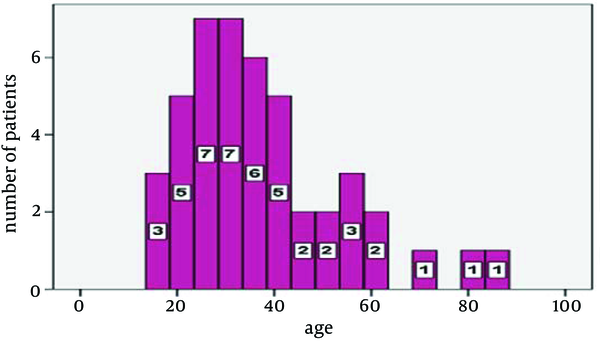 The average age of patients was 38.19 years (2-85 years).The average age of patients with positive PCR was 37.89 ± 16.55 years, and this amount in patients with negative PCR was 38.24 ± 17.13 years. Prevalence of Influenza A (H1N1) was higher in women (26 [56.52%]) than men (20 [43.48%]) among confirmed patients. The female- male ratio in patients with negative PCR was 195 : 129 (about 1.5 times). We could not find any significant correlation between PCR and gender using goodness-of-fit test (P = 0.832) (Figure 1). Most of the patients(13) were in the18-29-year age group (28.3%), followed by 30-39 years, including 12(26.1%), 40-49 years, 8 (17.4%) older than 60 years, 5 (10.9%), 50-59 years, 4 (8.7%), and younger than19 years, 3 (6.5%). In our study, the minimum age was 16, and the maximum was 85 years, the mode was 32 years, mean was 37.89 years and median age was 34 years old. 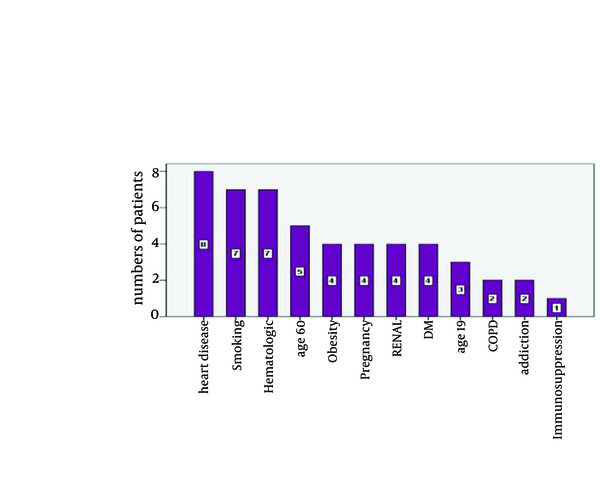 We could not find any significant correlation between the age of confirmed patients, and patients with negative PCR test (Figure 1).19 patients managed in an outpatient clinic and other patients were hospitalized. We considered PCR test as a test with high sensitivity and specificity accounted the patients with negative PCR as non-Influenza A (H1N1) patients and compared this group with PCR positive patients group for their risk factors, symptoms, ILI, CDC and WHO criteria with chi-square and independent T-test; but there was not any significant correlation between the two groups given the mentioned factors. Even when we chose a group equal to the confirmed patients from PCR negative patients with regard to gender and age and number, we did not find any correlation. The best explanation for this unpredictable result could be the low sensitivity of PCR test. It is probably due to the faults in process of test in manufacturing, transferring, performance and/ or interpretation. Evaluation of confirmed patients' symptoms has shown that 54.4 % of them have not been met the defined criteria of CDC, 91.3% of WHO defined category and 38.09% of ILI ones. The most common symptoms in our study was cough (89.1%) and then dyspnea (82.6%), chill(86.1%), body temperature higher than 37.8°C (51%) (without recent antipyretic medication). In evaluation of risk factors in the confirmed admitted patients we found hypertension and coronary heart disease in 8 cases (17.4%), cigarette smoking in 7 cases (15.2%), hematologic disorder in 7 cases (15.2%), older than 60 years patients in 5 cases (10.86), renal disease, pregnancy, diabetes mellitus and obesity, 4 cases in each group (8.7%), 18 years of age and younger, in3 cases (6.5%), opium addiction in 2 cases (4.3%), immunosuppression, 1 case (2.2%), old cerebrovascular accident, 3 cases (6.5%), and other neurologic disorders, 1case (2.2%), and we could not find any recognized risk factor in 5 patients. No correlation was observed between the confirmed patients, and patients with negative PCR test in terms of risk factors (Figure 2). In a study from April 15 to May 5, a total of 642 confirmed cases with influenza A (H1N1) infection were identified in 41 states of America. The ages of patients ranged from 3 months to 81 years; 60% of patients were 18 years of age or younger. Of 399 patients for whom hospitalization status was known, 36 (9%) required hospitalization. Of 22 hospitalized patients with available data, 12 had characteristics that conferred an increased risk of severe seasonal influenza, 11 had pneumonia, 8 required admissions to an intensive care unit, 4 had respiratory failure, and 2 died (6). In a similar study in California on 553 patients with confirmed or probable Influenza A (H1N1) infection, the most common risk factors for Influenza A (H1N1) complications were chronic lung disease (37%), immunosuppression (17%), heart disease (17%), diabetes mellitus (17%) and obesity (13%)(7). Interestingly, one of the confirmed patients in our study had received Influenza A (H1N1) vaccine and two patients had been immunized with seasonal vaccines. The frequency of symptoms in this study was as follow: cough in 40 cases ( 89.1%), dyspnea in 37 cases (82.6%) myalgia in 35 cases (76.1%), chill in 34 cases (73.9%), nausea in 25 cases (54.3%), fever >37.8° C in 24 cases ( 69.6%), vomiting and headache in 20 cases (each one 43.5%), diarrhea in 13 cases ( 28.3%), chest pain ( 26.1%), vertigo and sore throat in 10 cases (each one 23.9%), weakness in 4 cases (8.7%), back and flank pain in 1 case(each one 2.2%). We did not have any patients with red eye or sweating. Moreover, we did not find any significant correlation between the confirmed patients, and patients with negative PCR test in symptoms (Figure 3). Given the above-mentioned American study, the age of patients was 3 months to 81 years and 60% were under 18 years. The most common symptoms were fever (94%), cough (92%) and sore throat (66%). In that study 25% of patients had diarrhea and 25% had vomiting. In our study the body temperature ranged from 36 to 39.5°C and 45.65% had temperature lower than 37.7°C.Mean and median of temperature were 37.8, and mode was 37°C. We did not have any previous analgesic consumption in the confirmed patients. 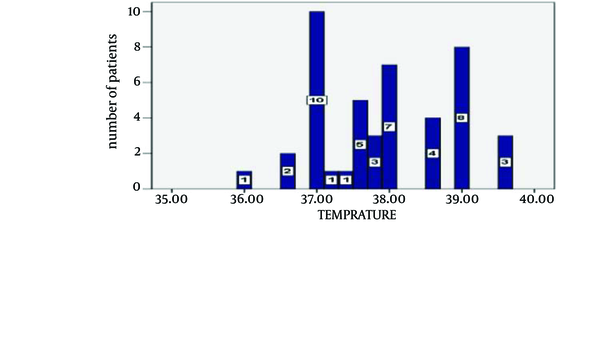 There was not found a significant correlation between the confirmed patients and patients with negative PCR test in high temperature (Figure 4). In another study in America in 268 hospitalized patients, the clinical findings included fever (93%), cough (83%), shortness of breath (54%), fatigue or weakness (40%), chill (37%), myalgia (36%), rhinorrhea (36%), sore throat (31%), headache (31%), vomiting (29%), wheezing (24%), diarrhea (24%). The body temperature ranged from 36 to 40°C and 47.7% of patients had temperature lower than 37.7°C(8). According to suggested symptoms by CDC, We found fever and cough in 21 (45.7%), fever plus sore throat in 4 (8.7%), fever and rhinorrhea in 1 (2.2%) and fever and nasal congestion was not observed among the confirmed patients. Twenty five (54.4%) of these patients did not fulfill the CDC criteria. Sudden onset of fever higher than 38°C (without recently antipyretic) was reported in only 4 confirmed cases. By addition of one of the symptoms mentioned in WHO criteria (cough, rhinorrhea, sore throat and nasal congestion) we respectively had 1, 2, 4 and 2 patients coincident with these criteria. 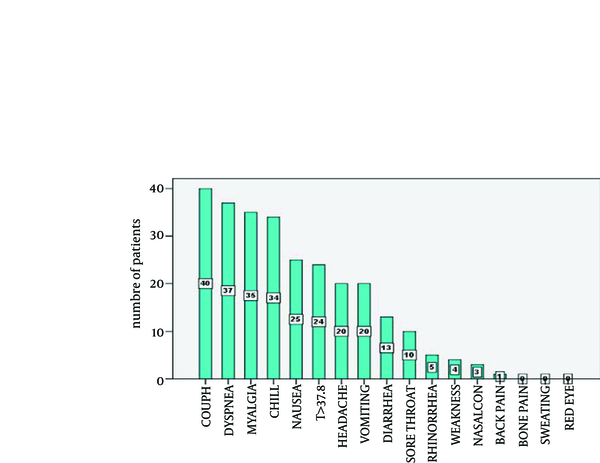 We did not find WHO criteria in 42 (91.3%) of these patients. We found that 16 (38.09%) of the confirmed patients did not meet ILI criteria. The mean hospitalization period was 4.45 days. Most of the patients were hospitalized for 3 days and the maximum days of hospitalization were 15 days. 6 (13.4%) of confirmed patients and 4 of PCR negative patients died in hospital. There were mostly patients with underlying diseases in the confirmed patient group including a16-year old patient with lymphoma, a 73 year-old case with hypertension, diabetes mellitus and COPD (1), a 20 year-old patient with obesity, a 80 year-old case with hypertension and coronary heart disease and 23 and 32 year old patients without any recognized underlying disease. PCR could not be a sensitive test for determination of confirmed patients with Influenza (H1N1) infection in our study because we do not expect that in an epidemic incidence, we just found H1N1 influenza in about one of eight patients with similar symptoms and signs. It is probably due to susceptibility of sampling method, improper temperature during transferring and maintenance of samples and test performance in spite of trained practitioners and even improper materials in spite of valid manufacturer company. It is reported because the need for preventing repeated faults in further studies seems to be necessary. The most common symptoms in the confirmed admitted patients were cough, dyspnea, chill, myalgia and fever. There was not any significant correlation between these symptoms or symptoms with less frequent rates or suggested symptoms by WHO or CDC or ILI with negative and positive PCR results. It was mainly due to the significant lower percentage of fever (51%) in the studied patients. The mean age of these patients was about 38 years that it was concordant with other studies. The authors would like to thank Mojtaba Moradi for his kind assistance in data analysis; and Dr Ghasem Khosravani for his interest in this research and dedicating the time to help us to perform PCR tests. We would also like to sincerely thank Behnam Honarvar for his heartily compliance in data collection. The questionnaires were filled by physicians of the referral hospital after obtaining the consent form from patients. Our data is collected from some parts of the history and diagnostic intervention of each case. Implication for health policy/practice/research/medical education: This study has two main massages. First, given different symptoms of flu H1N1 in the region under study, diagnosis cannot be made solely on the basis of fever. As a result, doctors should be more careful to categorize the patients according to CDC or WHO or ILI. Second, in line with the results of the study in the region under examination it is concluded that PCR has been an unreliable test for confirming the diagnosis. Notably, this test cannot be recommended for diagnostic purposes given its high expenses. Authors’ Contribution: To prepare this manuscript, Dr Hossain Faramarzi designed and filled out the questionnaire. Dr Maryam Barzgar and Dr Negar Panahi visited the patients and filled out the questionnaire. Dr Khalily Zade analyzed the data and wrote the manuscript. Dr Behrooz Fathi did the statistical analysis and worked with SPSS software. Financial Disclosure: There are no conflicts of interest among authors and their colleagues in this research. Funding/Support: This study received no fund or financial support. 3. Interim Guidance on Infection Control Measures for 2009 H1N1 Influenza in Healthcare Settings, Including Protection of Healthcare Personnel. 8. 2009 H1N1 early outbreak and disease characteristics.